Home » VectorVest » Buy Bonmarche #BON in the run up to results says VectorVest. Management self help initiatives set to drive growth. Buy Bonmarche #BON in the run up to results says VectorVest. Management self help initiatives set to drive growth. By Alan Green in VectorVest on 30th May 2018 . UK-based Bonmarche Holdings Plc (BON.L) is a womenswear value retailer focused on selling clothing and accessories in a range of sizes to women over 50 years old. The Company approximately has 270 stores in the UK. The Company offers a range of own brand womenswear, including coats and jackets, dresses, knitted tops, blouses, knitwear, t-shirts, leisurewear, skirts, trousers and shorts, lingerie, nightwear, swimwear, hosiery, footwear, accessories and jewellery. Its products are primarily sold through its own store portfolio, complemented by its Website, mail order catalogues, a telephone order service and through the Ideal World TV shopping channel. Subsidiaries include Bluebird UK Topco Ltd, Bluebird UK Holdco Ltd, Bonmarche Ltd and Bluebird UK Bidco 2 Ltd.
On April 20th, 2018, BON published a trading update for the year ending March 31st2018 and confirmed that, reflecting the good progress achieved during the financial year, the FY18 profit before tax will be in line with Board expectations. CEO Helen Connolly said that as anticipated, trading conditions in the final quarter of the financial year remained challenging and, against this backdrop…” I am pleased that we have delivered an increase in the FY18 profit before tax compared to last year. Whilst we expect the market to remain difficult, our focus will be on continuing to improve our proposition to customers through a number of self-help initiatives, which we expect to drive further progress for the business during the new financial year.”The FY results announcement will be published on Tuesday 19thJune 2018. In late March 2018, the VectorVest RT (Relative Timing) metric for BON flagged a move higher, indicating a possible buy opportunity for investors. RT is a fast, smart, accurate indicator of a stock’s price trend, and now with the stock trading at 101p, BON logs a current rating of 1.45 on this metric, which is excellent on a scale of 0.00 – 2.00. Other VectorVest metrics show the stock to be in positive territory, with a GRT (Earnings Growth Rate) of 15% considered to be very good. A fair RS (Relative Safety) rating of 0.85, (scale of 0.00 to 2.00) may see cautious investors avoid the stock, but regardless there is plenty of growth opportunity when taking into account the current VectorVest valuation of 130p. 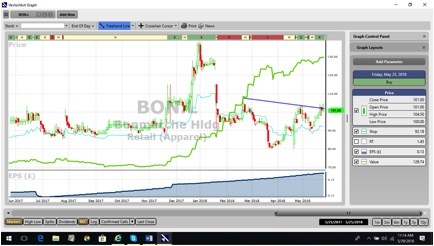 Summary: Many retail stocks have endured extended periods of tough trading over the past few years, and BON is no exception. However management have responded decisively to meet the challenging trading environment, and with further progress expected in the new financial year driven by self-help initiatives, VectorVest believes this quality retailer is worth backing for a sustained recovery in the run up to the results announcement. Buy. Readers can examine trading opportunities on BON and a host of other similar stocks for a single payment of £5.95. This gives access to the VectorVest Risk Free 30-day trial, where members enjoy unlimited access to VectorVest UK & U.S., plus VectorVest University for on-demand strategies and training. Link here to view.